Jan Nyman, the ace detective of the covert operations unit of the National Central Police, is sent to a sleepy seaside town to investigate a mysterious death. Nyman arrives in the town dominated by a bizarre holiday village - the `hottest beach in Finland'. The suspect: Olivia Koski, who has only recently returned to her old hometown. The mission: find out what happened, by any means necessary. 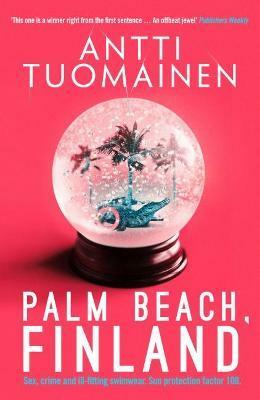 With a nod to Fargo, and dark noir, Palm Beach, Finland is both a page-turning thriller and a black comedy about lust for money, fleeing dreams and people struggling at turning points in their lives - chasing their fantasies regardless of reason. Finnish Antti Tuomainen (b. 1971) was an award-winning copywriter when he made his literary debut in 2007 as a suspense author. The critically acclaimed My Brother's Keeper was published two years later. In 2011 Tuomainen's third novel, The Healer, was awarded the Clue Award for `Best Finnish Crime Novel of 2011' and was shortlisted for the Glass Key Award. The Finnish press labelled The Healer - the story of a writer desperately searching for his missing wife in a post-apocalyptic Helsinki - `unputdownable'. Two years later in 2013 they crowned Tuomainen `The King of Helsinki Noir' when Dark as My Heart was published. With a piercing and evocative style, Tuomainen is one of the first to challenge the Scandinavian crime genre formula. The Man Who Died brought him to his literary best. Follow Antti on Twitter @antti_tuomainen, on Facebook facebook.com/AnttiTuomainen and on his website: www.antituomainen.com David Hackston is a British Translator of Finnish and Swedish literature and drama. Notable publications include The Dedalus Book of Finnish Fantasy, Maria Peura's coming-of-age novel At the Edge of Light, Johanna Sinisalo's eco-thriller Birdbrain, two crime novels by Matti Joensuu and Kati Hiekkapelto's Anna Fekete series (which currently includes The Hummingbird, The Defenceless and The Exiled, all published by Orenda Books). He also translates Antti Tuomainen's stories. In 2007 he was awarded the Finnish State Prize for Translation. David is also a professional countertenor and a founding member of the English Vocal Consort of Helsinki.